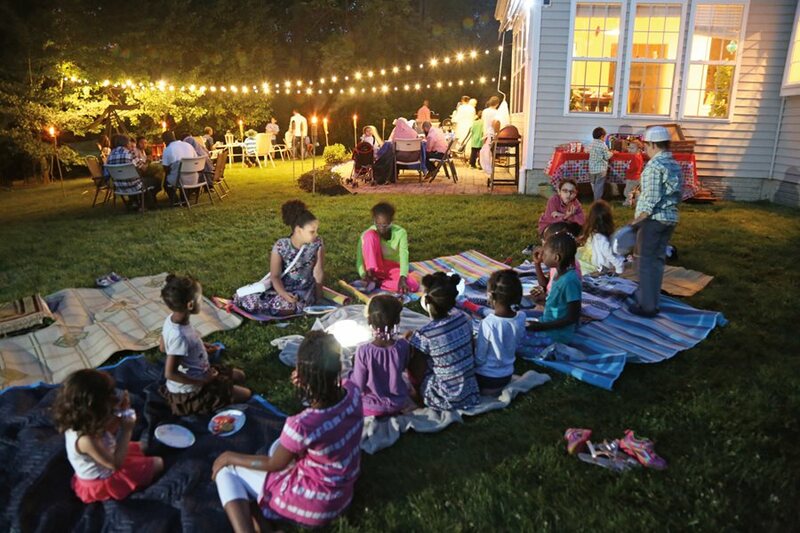 Friends and family enjoying a backyard potluck iftar gather in Howard County, Maryland, for a group photo. Above: Similar to many suburban get-togethers, parents deck out the lawn, already festooned with a bounce-house, fill bags of treats for children, and hang decorations. Rows of prayer mats are arranged in the grass, and guests make final touches to specialty dishes for the buffet feast. At 8:39, the moment of sunset, breaking of the daylong fast begins with a call to prayer followed by eager processions toward the table of food, leading to conversations over the multitude of dishes and exchanges of recipes. Noor’s deflated the bouncy castle again!” complains one of the children. I look over at our newly planted persimmon tree onto which the now-flaccid structure has fallen, right by our “Happy Ramadan!” garden flag in the lawn. I sigh, but it’s almost sunset and guests are arriving in droves, setting up their dishes of choice in the back yard. It’s potluck iftar tonight. What could be a more appropriate way to celebrate just a few days away from July 4, Independence Day? A few of my friends get to work laying out assorted prayer rugs, beach mats and throws on the lawn in anticipation of the prayer that will commence minutes after sunset. Later, we expect the kids to sit on them, glow sticks in hand, listening to the ghost stories one of the older girls has promised them. Two boys set off some firecrackers close to the bamboo trees and earn a scolding from one of the men. A few tired toddlers wail in the background. A couple of other kids try to sneak peeks at the goodie bags that have been set aside for them as those of fasting age anxiously await the call to prayer, the adhan, signaling it is time to break the day’s fast. One of the guests prepares a Caribbean jerk marinade from his native Virgin Islands in a blender by the grill, serenely oblivious to the hubbub around him. We’ve hung decorations and set out dates on tables scattered throughout the yard accompanied by glowing lanterns. Soon there is nothing left to do but restlessly check iPhone apps to see if it’s time yet. When someone’s phone goes off with the melodic adhan, we become still and listen. The holiest month of the Islamic lunar calendar, during which the observant fast from food, drink and worldly pleasures from dawn until sunset, Ramadan has a special significance everywhere, but it is a source of particular delight and anticipation in Muslim communities of the Western world. It is a month for spiritual recalibration, a time for purification of the soul, a time families and communities who are otherwise insular or busy keeping up with popular trends can calm down and, in the evening, come together around a single meal. It is a time to feed the soul, both figuratively and literally. Columbia, in Howard County, Maryland, where my family and I live, is a bedroom community of Washington, D.C., and it’s an incredible place to encounter “Muslim Americana.” We know families that have been here for generations as well as recent immigrants and refugees. From Bosnia to Palestine, Senegal, Puerto Rico, Malaysia, Africa or Europe, we all share a common purpose in this one sacred month when friends and family slow down, gather for evening prayers, reflect on the year gone by and the standing of their faith, and share meals. And what meals they are. Iftar fare! Meals prepared uniquely during Ramadan. They are both nourishment and a reminder of what to be thankful for after a day of material deprivation, vehicles to carry histories and traditions. And only at an iftar in the us, where the history of Islam dates back to the era of slavery, can one experience a mélange like that which appeared on our tables. Welcome to the potluck! If you are born into a Muslim family, Ramadan is second nature. If you come to Islam later in life, tradition is cultivated. Born to Puerto Rican and Italian parents and originally from Brooklyn, Francesca Pagan now lives in Laurel, Maryland. She became a Muslim some 15 years ago while she was in college. She says she takes her Italian grandmother’s tradition of cucina povera, or peasant food, and adapts it to Ramadan. 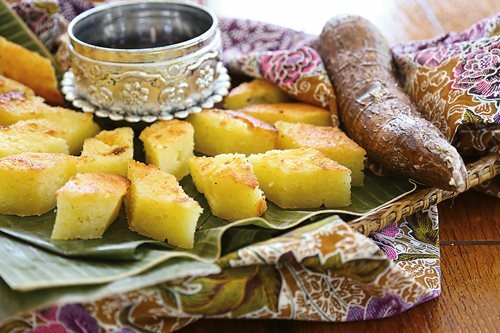 Suriati Othman meticulously arranges and rearranges her flawlessly cut diamond-shaped tapioca cakes on a vibrantly colored batik cloth layered with a banana leaf. In the middle sits a small bowl of water. “The water is to cleanse one’s hands after eating the cake. It’s traditional in Malaysia,” explains Suriati. “Presentation is critical,” she emphasizes. 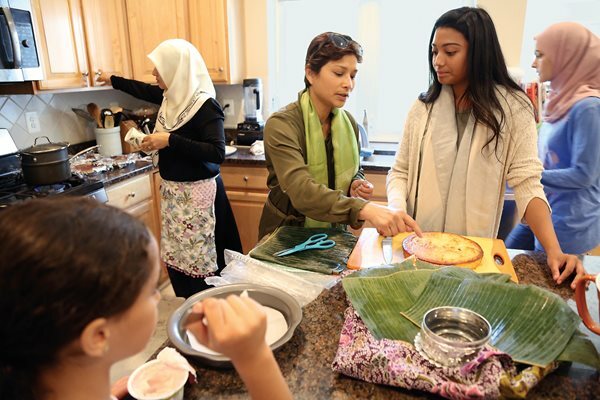 For Suriati and her daughter Nabeela Mohamed, 18, America is a home they adopted more than a decade ago when they came with their husband’s and father’s work. At first they assumed it would be temporary, but 13 years later, they have put down roots in Howard County. Nabeela recalls how, on trips back to Malaysia during Ramadan, she would watch her grandmother spend hours whipping up elaborate dishes. This time spent cooking together for a month ranks among her fondest memories. “In Malaysia. She’s talking about in Malaysia,” her mother solemnly tones in. The move was a big change for Suriati, and she is constantly reminded of it, especially during meal preparation. Her extended family of 30 or 40 suddenly shrank to four. But she has learned to “extend” her family through her community—and that there is no better time to do this than in Ramadan. “Ramadan for me is about self-reflection. Thinking about myself, thinking about my relationship with the people around me: my loved ones, my family, my friends, my community. The most important thing is my relationship with my creator,” says Suriati. 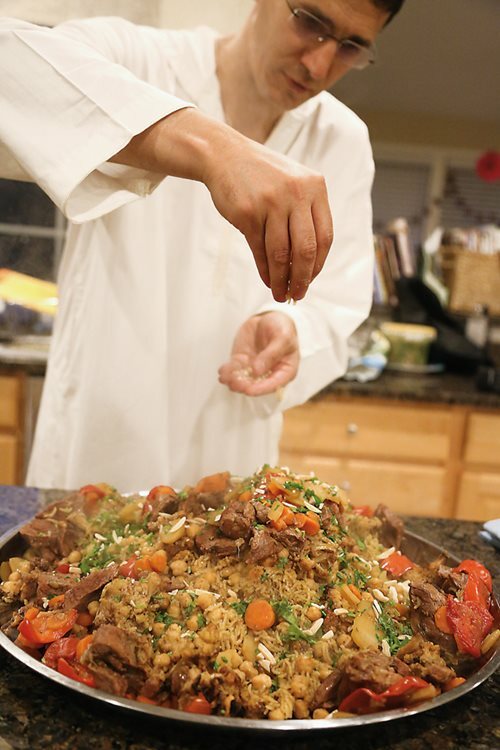 Yassine Daoud carefully steadies a large pot brimming with steaming spiced rice, packed with roasted cauliflower and fork-tender lamb. He places a large stainless steel tray on top, then flips the entire pot in one swift motion. The contents empty out neatly in a cake-like mold that we then jewel with fried nuts and chopped parsley. “It’s the rite of passage of the man of the house to flip it. The women do all the work, and then we men can come around and say we actually participated!” he jokes. 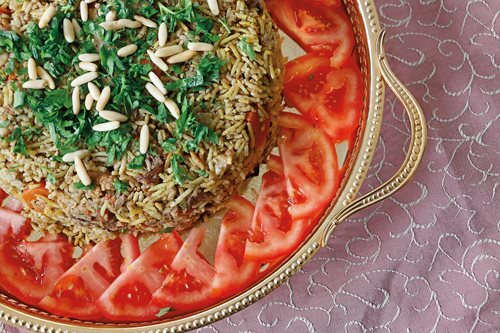 Though not necessarily a Ramadan-specific dish, maqlouba is synonymous with Palestinian family gatherings. “It’s healthy. It’s homey. It’s filling. And it’s a diverse dish with multiple ingredients,” he adds. Yassine knows much about health and home. From a childhood in a Palestinian refugee camp in Lebanon, and then winning a scholarship to boarding school in New Mexico at age 15 before he knew more than a few words of English, he is now a leading eye surgeon at Johns Hopkins. Ramadan for Yassine brings back memories of cherished moments in the camp—staying up all night with neighborhood kids, waiting in anticipation for sweets and indulging in holiday desserts. But the most important part was when the entire family would come together. He and his family of 11 shared a single room, but on any given Ramadan evening, they would entertain or feed 15 to 20 guests, often by kerosene lamp light. How did he keep the spirit of Ramadan alive? Yassine poignantly notes that it worked the other way around. Nuriman Mamut Sheets surveys the living room and makes herself comfortable in the middle of the floor. She fans out an embroidered Turkish tablecloth, tidily arranges platters and gets to work grating squash, mincing onions, slicing and spicing steak, and rolling dough. Three girls, two of them opportune visitors from next door, draw close. Intrigued, the girls get comfortable. During Ramadan, she says, she found it again, but differently: not one community, but many. All American and all bringing with them different traditions. Now Nuriman continues this tradition with her own family: She grows her fruits and vegetables in the summer and raises chickens, which her six children help keep. They also make regular visits to her local farmer’s market, where there is seldom a purveyor who does not know her name. Many a neighbor and friend have been at the receiving end of her bounty. “My mom also saved a plate for somebody else,” she says. “You would never know who comes to your door. In Arabic it’s called ‘their share,’ or naseeb, because God provides for everybody.” She, too, hands out food to her neighbors. The pies are not setting yet. Faridah Abdul-Tawwab Brown opens the oven door to check on them, apprehensive. She keeps her Ramadan cool, however, and places an emergency troubleshooting phone call to her mother, Najwa, in Florida. 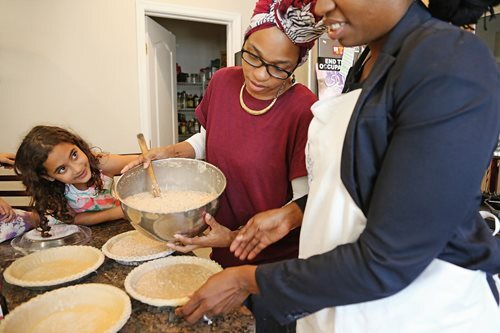 We are making bean pies, a dessert popularized in the 1960s by African American Muslims. The kitchen is abuzz. My own two girls are scurrying about, one clumsily pouring Turbinado sugar into the mixer, the other making herself useful by licking leftover pie mix. My husband helps open cans of navy beans (“If Mommy were to find out we weren’t using dried beans, that’d be the end of us!” says Faridah), as Fatimah Fanusie, Faridah’s twin sister, moves nervously around. Baking 12 pies that you can’t taste-test because you are fasting is risky. Butter is whipped, and billows of nutmeg, cinnamon and cornstarch float through the air. 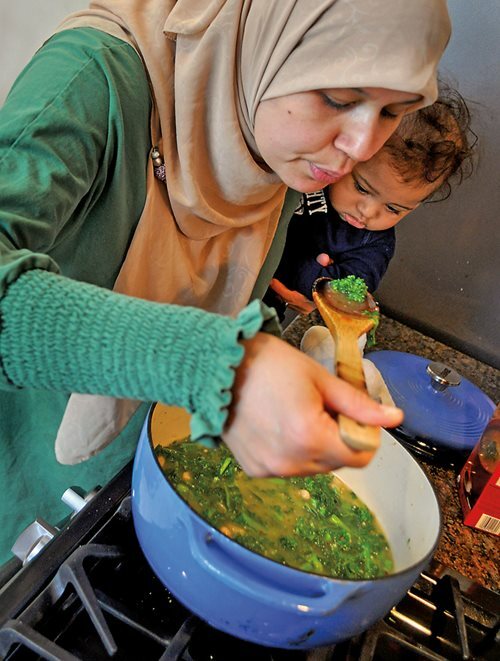 “Fasting and cooking is an adventure,” quips Fatimah. Faridah and Fatimah were born and raised in inner-city Boston, surrounded by colleges and college students from all over the world. Their parents came to Islam through the political and religious movements of the time. It is an experience perhaps few Muslims outside of their own communities are familiar with across America. “Halloween trick-or-treating, Christmas, and we weren’t allowed to participate in most of those. Ramadan was our time,” says Fatimah. “As African Americans we got to experience the traditions coming out of our community and from all over the Muslim world. We would have our iftars—you know, the bean pies, the fried fish, barbecued chicken, things of that nature that were distinct to our experience as northern African Americans with a rich history in the American south. As for the iftars themselves (which Faridah describes as “30 days of Thanksgiving”), they were neighborhood affairs. Clean escarole thoroughly by detaching leaves and washing in a tub, then chop. Heat a heavy-bottomed pot over medium high flame for 2 minutes. Add olive oil, garlic, oregano and red pepper flakes. Stir with wooden spoon until fragrant, about 1 minute. Lower flame to medium and add the escarole and a pinch of salt. Stir with wooden spoon until it wilts down to half the volume, about 3 minutes. Add the cannellini beans and water. Bring to a boil over high heat, then reduce to the lowest flame. Cover the pot and let simmer for 15 minutes to blend flavors. Serve piping hot in wide-mouthed bowls. Sprinkle generously with grated Pecorino Romano and eat with a hefty piece of crusty bread torn from the loaf. Enjoy! Preheat oven to 375°F. Grease a 9 x 9-inch square tin or baking pan. After grating tapioca, squeeze out as much juice as possible. Mix all the ingredients in a large, microwaveable mixing bowl. Microwave on high for 1 minute until the mixture is thick. Pour into the greased tin, and bake for 40 minutes. After 40 minutes, remove from the oven and glaze with 1 T of coconut cream. Set oven to broil and put the glazed tapioca cake in the oven for about 3 minutes to brown the top. Watch carefully so it does not scorch! Then let the cake cool before cutting into pieces. This all-star of Palestinian dishes, literally called “upside-down,” makes a spectacular presentation. Traditionally made with lamb, maqlouba is also wonderful with chicken or beef. 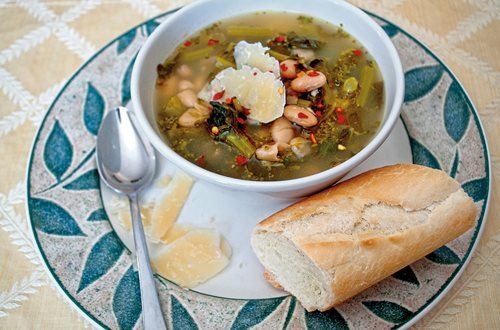 This recipe serves a hungry crowd of 8–10. 1. If using chicken, wash in a bowl of cold water with a fistful of flour, a little lemon juice or vinegar and 2 T of salt. Rinse and drain. If using lamb, simply rinse under water and drain. 2. Brown the chicken in a little oil. Add enough water to fully submerge, then bring to a boil and skim. If using lamb, no need to brown it, just submerge in plenty of water, bring to boil and skim. 3. Reduce heat to medium, then stir in all remaining broth ingredients. Simmer until tender (60–90 minutes). Strain, reserving the broth. 4. While the broth is simmering, salt and either fry or roast the eggplant as follows: slice eggplants uniformly, then spread them over a kitchen towel and sprinkle both sides with salt. Either fry in very hot vegetable oil until brown or slather with olive oil and oven-roast at 400°F. until golden, flipping halfway. Remove when golden and slightly charred. 5. If using cauliflower, wash, separate florets, drizzle generously with olive oil and roast in a hot oven about 25 minutes until browned. 6. Soak the rinsed rice in a bowl of cold water for 15 minutes. 7. Meanwhile, sauté the onions in 2 T of the olive oil on medium heat until caramelized, adding the garlic halfway through the process. 8. Strain the rice, then add the cooked onions and garlic; mix together with salt, cinnamon and idra spices. Set aside. 9. Generously grease the bottom and sides of a large non-stick pot with olive oil. Do not skip this step or your rice will burn! Arrange the potato slices on the bottom in a circular, overlapping pattern, followed by the tomato slices, red pepper, carrots, cooked chicken or lamb, roasted eggplant or cauliflower and chickpeas, all in successive layers. 10. Pack the rice mixture into the pot on top of the vegetables, using your hand to ensure it is well compacted. Ladle the reserved broth over the rice until just covered, using approximately 1½ c of broth for every cup of rice. 11. Bring the maqlouba to a boil, then reduce heat to low and cover tightly. After 30-35 minutes, taste the rice: if still too hard, add a bit more broth, a ladleful at a time, and leave on low heat until tender, allowing steam to cook it. 12. Remove pot from heat and let rest, covered, for 30 minutes. Meanwhile panfry the pinenuts or almonds in the remaining olive oil and set aside. 13. Uncover the rice and place a large round tray, slightly larger than the pot, serving side down, on top of the pot. Hold on carefully and swiftly—in one continuous motion—flip both pot and tray upside-down. Take care not to burn yourself! Tap on the pot with a wooden spoon (a task ordinarily assigned to children), then gently lift it off, allowing the maqlouba to slide out, as out of a mold. It’s okay if it falls apart! 14. Adorn with the fried nuts and chopped parsley. Serve immediately with plain yogurt and a minced salad of cucumbers, tomatoes, green onions and parsley, dressed with olive oil, lemon juice and salt. “Breaking fast with pitir manta made with friends and family with the remembrance of God and the stories from our past is an amazing part of my personal Ramadan,” says Nuriman. “While I am making it here in the United States, I know so many Uighurs are making it during their Ramadan as well! It connects me to my childhood memories. It takes me spiritually to my mehelle, my neighborhood, where the aromatic smell of pitir manta perfumes the air.” It is traditionally made with ground lamb, but Nuriman uses sirloin steak. You can use either one. 1. Knead the dough ingredients until combined and no longer sticky, about five minutes. (“You should be able to push your finger through when it is ready, harder than pizza dough.”) Adjust water and flour for this consistency. Cover and set aside in the fridge to chill. 2. Prepare the stuffing by sautéing the onion in the olive oil until transparent. Set aside. Slice the chilled steak in almost translucently thin strips. Combine the meat (or ground lamb) with the onion, squash and remaining ingredients. 3. Roll the chilled dough into two logs. Cut into approximately 12 equal portions and roll each into a small ball using both hands. Flatten using the palm of your hand into a small disc. Then set it aside to relax for 10 minutes. 4. Prepare your steam pot. If you don’t have one, use a colander with a side base and place it inside a pot filled with a couple of inches of water. Cover and bring to a simmer. Keep the water level under the steamer or colander. 5. Roll out each disc on a floured surface into a thin circle, roughly 2-3 times the size of the original. Put the flattened dough in your hand; then place a generous tablespoon of stuffing inside the center. Fold in half, crimp the edges and set aside onto a floured tray or greased pan. 6. 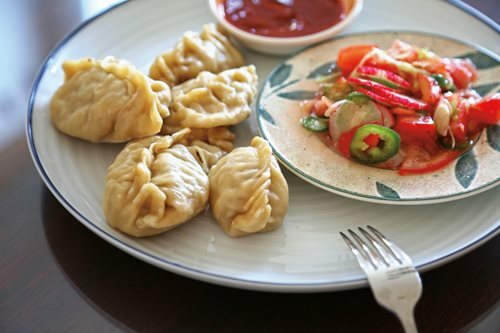 Rub a little vegetable oil on the inside of your steam pan to prevent the dumplings from sticking. Gently place dumplings inside the steamer, making sure not to overcrowd them. Using a paper towel, dab a little oil on top of each dumpling as well. Cover and steam for approximately 15 minutes. 7. Serve alongside a dipping sauce made of one part Sriracha hot sauce to one part ketchup, and a basic salad of cucumbers, finger peppers and tomatoes seasoned with vinegar, olive oil and salt. Begin with the crusts. Mix flour, sugar and salt in a food processor. Add butter and pulse until a coarse meal forms. Gradually blend in enough ice water to form moist clumps. Gather the dough into a ball, divide in half and form into two balls. Flatten into disks. Wrap each disk in plastic and chill 2 hours or overnight. Then remove one crust disk from the refrigerator. Let it sit at room temperature for 5–10 minutes so it can soften just enough to make rolling out a bit easier. Roll out with a rolling pin on a lightly floured surface to a 12-inch circle, or about 1/8-inch thick. Carefully place it onto a 9-inch pie plate. Gently press the pie dough down so that it lines the bottom and sides. Trim and crimp to leave a couple cm over the edge. 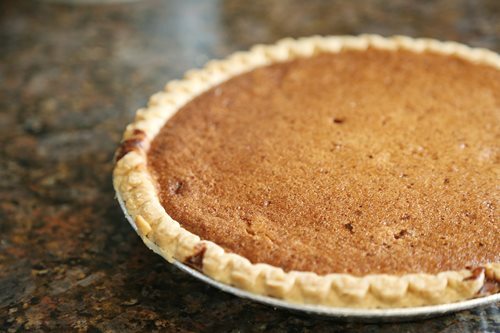 To prepare for the filling, prick the bottom of the pie crust with a fork about 20 times. To make the filling, soak the dry beans along with the baking soda overnight in water. Drain, then add 3 c of water for each cup of beans. Bring the beans to a boil and simmer partially covered for 60–90 minutes. When they are cooked, preheat oven to 350°F. In a blender, blend beans, butter, milk, eggs, nutmeg, cinnamon and corn starch about 2 minutes on medium speed. Pour mixture into a large mixing bowl. Add sugar and lemon extract and mix well. Then pour into the prepared pie shells. Bake about one hour, until golden brown. "This salad is common on a Ramadan table in the Gaza Strip, my native home. It is meant to utilize leftover salad components and day-old bread. This recipe was originally featured in The Gaza Kitchen: A Palestinian Culinary Journey, and it was the dish I prepared for my potluck iftar." Break apart the toasted bread. Chop chili peppers, removing some of the membranes and seeds. In a mortar and pestle, pound the peppers along with the salt until soft. Add the basil and muddle to extract flavor. Add the green onions and crush well, followed by the cucumbers. Finally, stir in the tomatoes and mash up. Mix the entire salad to incorporate all ingredients. In a separate bowl, whisk the tahini with the lemon juice until emulsified. Right before serving, mix the tahini sauce and bread pieces into the salad. Transfer to a serving dish and flatten the top. Drizzle the surface generously with a good quality olive oil. 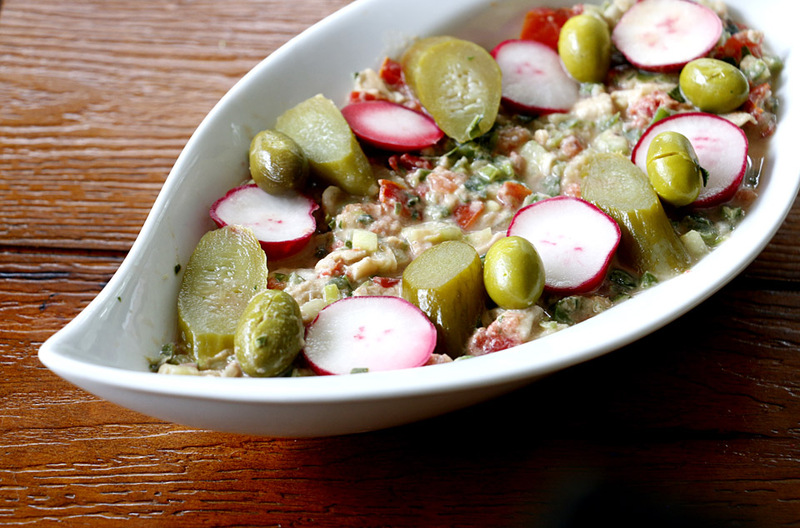 Garnish with pitted green olives, pickled peppers, and radish slices. Maryland-based journalist Laila El-Haddad (www.LailaHaddad.com) is the author of The Gaza Kitchen: A Palestinian Culinary Journey (Just World Books, 2013). She frequently writes on the intersection of food and politics and is currently working on a book about the history of Islam in America, as told through food. Follow her on Facebook, or on Twitter @Gazamom.